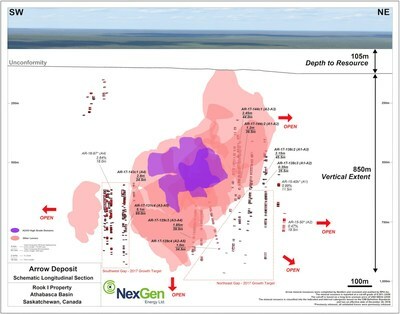 VANCOUVER, June 7, 2017 /CNW/ - NexGen Energy Ltd. ("NexGen" or the "Company") (TSX:NXE, NYSE:NXE) is pleased to report radioactivity results for the final sixteen holes of the winter 2017 drilling program at our 100% owned, Rook I property, Athabasca Basin, Saskatchewan. Step out hole AR-17-131c3 which was drilled 36 m southwest of the A4 resource grade shell (120 m northeast and down-dip from AR-16-97) intersected 69.0 m of total composite mineralization including 5.1 m of total composite off-scale radioactivity (>10,000 to >61,000 cps) within a 343.0 m section (647.0 to 990.0 m) in the A3 through A5 shears. Step out hole AR-17-143c1 which was drilled 100 m above and southeast of the A4 resource grade shell (100 m northeast and up-dip from AR-16-97) intersected 24.5 m of total composite mineralization including 2.8 m of total composite off-scale radioactivity (>10,000 to >61,000 cps) within an 86.0 m section (620.5 to 706.5 m) in the A4 shear. Drilling northeast of the Arrow Deposit between the mineral resource domains and mineralized drill holes not included in the updated mineral resource estimate continues to return significant mineralization and off-scale radioactivity. Step out hole AR-17-138c2 which was drilled 35 m northeast of the A1 resource grade shell (334 m northeast and down-dip from AR-15-44b) intersected 45.5 m of total composite mineralization including 3.15 m of total composite off-scale radioactivity (>10,000 to 41,000 cps) within 287.0 m section (468.0 to 755.0 m) in the A1 through A3 shears. In addition, the Company is pleased to announce the identification of visible pitchblende mineralization located 300 m southeast of the Arrow Deposit. Exploration hole RK-17-118w1 intersected 0.5 m of anomalous radioactivity measuring a maximum of 1,300 cps at 490.5 m down-hole. This new occurrence of anomalous radioactivity is located on an Arrow-parallel conductive feature where significant sections of stacked hydrothermal alteration and graphitic shear zones were intersected in the only two holes drilled in the area. Mineralized hole RK-17-118w1 was the last hole drilled prior to the termination of the winter program. The 2017 winter program comprised 40,768.5 m of drilling in 64 holes with seven drill rigs. Assays remain pending for 56 holes (34,270.5 m) from Arrow and 8 exploration holes (6,498 m) drilled proximal to Arrow. A summer drill program focused on further Arrow Deposit delineation as well as expansion drilling is scheduled to commence in early Q3. The Company has cash on hand of approximately $57 million. A longitudinal section and maps showing drill hole locations are shown in Figures 1 to 3. Tables 1 and 2 show summaries of the mineralized intervals. Garrett Ainsworth, Vice-President, Exploration and Development, commented: "Drilling in the southwest and northwest gaps of the Arrow Deposit has been highly successful by returning both broad intervals of mineralization incorporating high grade zones. The southwest and northeast gaps will be targeted in the summer 2017 program to ensure that mineralization in these zones are optimally incorporated into future Arrow resource grade shells. 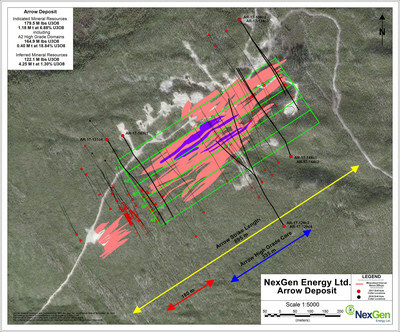 Exploration drilling at a prospective ground 3D resistivity anomaly located 300 m southeast of the Arrow Deposit has returned elevated radioactivity and visible uranium mineralization and will be a priority target of future programs." Leigh Curyer, Chief Executive Officer, commented: "Exploration in winter has delivered discovering new zones of mineralization inside and outside of the area of previously known mineralization. The growth of Arrow this winter and evident heading into future programs is clearly evident, whilst simultaneously advancing on engineering and permitting studies. Our maiden PEA is scheduled to be completed in the coming months providing a basis to rank Arrow on a global scale to other producing and advance development uranium projects." All depths and intervals are meters downhole, true thicknesses are yet to be determined. Resource modelling in conjunction with an updated mineral resource estimate is required before true thicknesses can be estimated. Hole AR-17-129c3 was a directional hole that departed hole AR-17-129c2 at 525 m. It was designed to test the A4 shear 35 m up-plunge to the northeast of AR-15-41 (4.30% U3O8 over 20.5 m in the A4 shear) with an additional A3 intersection 50 m down-dip of AR-15-39 (2.27% U3O8 over 29.5 m in the A3 shear). Directional drilling was initiated at 537 m. The A3 and A4 shears were both intersected at an inclination of -68.5°. Basement lithologies were intersected from the top of the hole and dominantly consisted of semi-pelitic gneiss with relatively narrow intervals of graphitic pelitic gneiss and mylonite (the A3 through A4 shears). The hole successfully intersected anomalous to strongly anomalous radioactivity in the A3 through A5 shears in association with stringers, disseminated, fracture-controlled, and foliation-controlled pitchblende mineralization. A total composite mineralization of 39.0 m including 1.85 m of off-scale radioactivity (>10,000 to >61,000 cps) was intersected within a 156.5 m section (796.5 m to 953.0 m). In the A3 shear, 19.5 m of composite mineralization was intersected including 0.75 m of off-scale radioactivity. In the A4 shear, 19.5 m of composite mineralization was intersected including 1.1 m of off-scale radioactivity was intersected. The hole was terminated at a depth of 981.5 m.
Hole AR-17-129c4 was a directional hole that departed pilot hole AR-17-129c2 at 453 m. It was designed to test the A4 shear 150 m up-dip and to the northeast of AR-15-41 (4.30% U3O8 over 20.5 m in the A4 shear) with an additional A3 intersection 125 m up-dip and to the northeast of AR-15-39 (2.27% U3O8 over 29.5 m in the A3 shear). Directional drilling was initiated at 472 m. The A3 and A4 shears were both intersected at an inclination of -59°. Basement lithologies were intersected from the top of the hole and dominantly consisted of semi-pelitic gneiss with relatively narrow intervals of graphitic pelitic gneiss and mylonite (the A2 through A4 shears). The hole successfully intersected anomalous to strongly anomalous radioactivity in the A2 through A5 shears in association with stringers, disseminated, fracture-controlled, and foliation-controlled pitchblende mineralization. A total composite mineralization of 34.5 m including 1.0 m of off-scale radioactivity (>10,000 to 53,000 cps) was intersected within a 373.0 m section (612.0 to 985.0 m). In the A2 shear, 7.5 m of composite mineralization was intersected. In the A3 shear, 22.0 m of composite mineralization was intersected including 0.35 m of off-scale radioactivity. In the A4 shear, 3.0 m of composite mineralization was intersected including 0.4 m of off-scale radioactivity. In the A5 shear, an additional 2.0 m of composite mineralization was intersected including 0.25 m of off-scale radioactivity. The hole was terminated at a depth of 1023.5 m.
Hole AR-17-131c4 was a directional hole that departed hole AR-17-131c3 at a depth of 306 m. It was designed to test the Arrow Deposit in the southwest gap target area, 120 m down-dip and northeast of AR-16-97 (2.64% U3O8 over 18.0 m in the A4 shear). Directional drilling was initiated at 318 m. The A3 and A4 shears were intersected at an inclination of -71°. Basement lithologies were intersected from the top of the hole and dominantly consisted of semi-pelitic gneiss with relatively narrow intervals of graphitic pelitic gneiss and mylonite (the A3 and A4 shears). The hole successfully intersected anomalous to strongly anomalous radioactivity in the A3 through A5 shears in association with disseminated, fracture-controlled, and foliation-controlled pitchblende mineralization. A total composite mineralization of 69.0 m including 5.1 m of off-scale radioactivity (>10,000 to >61,000 cps) was intersected within a 343.0 m section (646.0 to 990.0 m). In the A3 shear, 30.0 m of composite mineralization was intersected including 0.65 m of off-scale radioactivity. In the A4 shear, 38.0 m of composite mineralization was intersected including 4.45 m of off-scale radioactivity. An additional 1.0 m of composite mineralization was intersected in the A5 shear. The hole was terminated at a depth of 1044.5 m.
Hole AR-16-138c1 was a directional hole that departed pilot hole AR-17-138c1 at 249 m. It was designed to test the gap area to the northeast of the Arrow Deposit resource domains, 105 m northeast of AR-17-127c1 (21.5 m of composite mineralization in the A2 shear; assays pending). Directional drilling was initiated at 213 m. The A2 shear was intersected at an inclination of -63.5°. The hole was terminated at 879.5 m.
Basement lithologies were intersected from the top of the hole and dominantly consisted of semi-pelitic gneiss with relatively narrow intervals of pelitic gneiss and mylonite (the A1 through A3 shears). The hole successfully intersected anomalous to strongly anomalous radioactivity in the A1 through A3 shears in association with stringers, disseminated, fracture-controlled, foliation-controlled, and massive pitchblende mineralization. A total composite mineralization of 45.5 m including 3.15 m of off-scale radioactivity (>10,000 to 35,000 cps) was intersected within a 287.0 m section (468.0 m to 755.0 m). In the A1 shear, 33.5 m of composite mineralization was intersected including 3.15 m of off-scale radioactivity. In the A2 shear, 11.5 m of composite mineralization was intersected. In the A3 shear, 0.5 m of composite mineralization was intersected. The hole was terminated at a depth of 879.5 m.
Hole AR-16-138c3 was a directional hole that departed pilot hole AR-17-138c1 at 183 m. It was designed to test the gap area to the northeast of the Arrow Deposit resource domains, 130 m up-dip and northeast of AR-17-127c1 (21.5 m of composite mineralization in the A2 shear; assays pending). Directional drilling was initiated at 195 m. The A2 shear was intersected at an inclination of -60.5°. The hole was terminated at 660.5 m.
Basement lithologies were intersected from the top of the hole and dominantly consisted of semi-pelitic gneiss with relatively narrow intervals of pelitic gneiss and mylonite (the A1 through A2 shears). The hole successfully intersected anomalous to strongly anomalous radioactivity in the A1 and A2 shears in association with stringers, disseminated, fracture-controlled, foliation-controlled, and massive pitchblende mineralization. A total composite mineralization of 25.5 m including 0.35 m of off-scale radioactivity (>10,000 to 18,000 cps) was intersected within a 194.0 m section (427.5.0 m to 621.5 m). In the A1 shear, 17.0 m of composite mineralization was intersected. In the A2 shear, 8.5 m of composite mineralization was intersected including 0.35 m of off-scale radioactivity. The hole was terminated at a depth of 660.5 m.
Hole AR-17-143c1 was collared from surface at an angled orientation (-70°) to the southeast (147° Azimuth). It was designed to test the Arrow Deposit in the southwest gap target area, 100 m up-dip and northeast of AR-16-97 (2.64% U3O8 over 18.0 m in the A4 shear). Directional drilling was initiated at 252 m. The A4 shear was intersected at an inclination of -65°. The hole intersected hematized Athabasca Group sandstones between 97.0 m and the unconformity at 104.9 m. Basement lithologies largely consisted of semi-pelitic gneiss and relatively narrow intervals of pelitic gneiss and mylonite. The hole successfully intersected anomalous radioactivity associated with vein and fracture-hosted pitchblende mineralization. A total composite mineralization of 24.5 m including 2.8 m of off-scale radioactivity (>10,000 to >61,000 cps) was intersected within an 86.0 m section (620.5 m to 706.5 m), all within the A4 shear. The hole was terminated at a depth of 852.5 m.
Hole AR-16-144c1 was a scissor hole collared from surface at an angled orientation (-70°) to the northwest (327° Azimuth). It was designed to test the A3 shear 90 m up-plunge to the northeast of AR-17-116c1 (6.5 m of off-scale radioactivity in the A3 shear; assays pending). Directional drilling was initiated at 171 m. The A3 shear was intersected at an inclination of -60.8°. The hole intersected bleached Athabasca Group sandstones between 105.0 m and the unconformity at 112.9 m. Basement lithologies dominantly consisted of semi-pelitic gneisses with intervals of graphitic pelitic gneiss (the A1 through A3 shears) including mylonite. The hole successfully intersected anomalous to strongly anomalous radioactivity in the A2 through A3 shears in association with stringers, disseminated, foliation-controlled, fracture-controlled, and semi-massive to massive pitchblende mineralization. A total composite mineralization of 44.0 m including 2.45 m of off-scale radioactivity (>10,000 to >61,000 cps) was intersected within a 156.0 m section (460.0 to 616.0 m). In the A2 shear, 42.0 m of composite mineralization was intersected including 2.45 m of off-scale radioactivity. In the A3 shear, 2.0 m of composite mineralization was intersected. The hole was terminated at a depth of 801.0 m.
Hole AR-17-144c2 was a directional hole that departed pilot hole AR-17-144c1 at 222 m. It was designed to test the A3 shear 55 m up-dip and northeast of AR-17-136c2 (6.7 m of off-scale radioactivity in the A3 shear; assays pending). Directional drilling was initiated at 235 m. The A3 shear was intersected at an inclination of -55.5°. Basement lithologies were intersected from the top of the hole and dominantly consisted of semi-pelitic gneiss with relatively narrow intervals of pelitic gneiss and mylonite (the A1 through A3 shears). The hole successfully intersected anomalous to strongly anomalous radioactivity in the A1 through A2 shears in association with stringers, disseminated, fracture-controlled, foliation-controlled, and massive pitchblende mineralization. A total composite mineralization of 36.5 m including 1.2 m of off-scale radioactivity (>10,000 to >61,000 cps) was intersected within a 186.0 m section (468.5 to 654.5 m). In the A1 shear, 9.5 m of composite mineralization was intersected including 0.5 m of off-scale radioactivity. In the A2 shear, 27.0 m of composite mineralization was intersected including 0.7 m of off-scale radioactivity. The hole was terminated at a depth of 723.5 m.
Holes RK-17-114, RK-17-117 and RK-17-117w1 tested an Arrow-parallel conductor marked by a high resolution ground 3D resistivity survey (as well as previously completed airborne VTEM surveys) located 350 m southeast of the Arrow deposit. Hole RK-17-114 was collared at an angled orientation (-70°) to the southeast (140° azimuth). Hole RK-17-117 was collared at an angled orientation (-70°) to the northwest (320° azimuth). Hole RK-17-117w1 was wedged off RK-17-117 at 201 m. All three holes largely intersected intrusive gneiss with sections of Arrow-like semi-pelitic gneiss and graphitic shear zones (the conductor). Zones of strong clay alteration, silicification and hematization were intersected in each hole. Neither RK-17-114 or RK-17-117w1 intersected anomalous radioactivity before being terminated at 708 m and 776.5 m, respectively. Hole RK-17-117 intersected anomalous radioactivity which measured a maximum of 560 cps over 1.0 m beginning at 187.5 m before it was terminated at 801.5 m. However, spectrometer analysis indicated that the anomalous radioactivity was due exclusively to the presence of thorium. Holes RK-17-115 and RK-17-116 were collared as a fence to test for mineralization within the interpreted extensions of the Arrow shear zones 600 m along strike to the northeast of the deposit. Both holes were drilled at angled orientations (-70°) to the northwest (327° azimuth). Drilling tested a significant airborne resistivity anomaly located at the same elevation as the higher grade A2 sub-zone at the Arrow Deposit, where a similar anomaly has been identified. Both holes intersected Arrow-like semi-pelitic gneiss and graphitic shear zones (the conductor). In addition, both holes intersected broad zones of Arrow-like hydrothermal alteration spatially associated with the graphitic shears zones which featured silicification, clay alteration and hematization. No anomalous radioactivity was intersected in RK-17-115 before it was terminated at 817.0 m. Hole RK-17-116 intersected anomalous radioactivity which measured a maximum of 540 cps over 0.5 m beginning at 495.0 m before being terminated at 810.5 m. However, spectrometer analysis indicated that the anomalous radioactivity was due exclusively to the presence of thorium. Holes RK-17-118 and RK-17-118w1 were drilled as a fence to test the same Arrow-parallel conductor tested by RK-17-114, RK-17-117 and RK-17-117w1 approximately 600 m southwest from those holes. Hole RK-17-118 was collared at an angled orientation (-70° dip) to the northwest (327° azimuth). Hole RK-17-118w1 was wedged off RK-17-118 at 138 m. Both holes intersected basement lithologies consisting of a mix of semi-pelitic and intrusive gneiss. Hole RK-17-118 intersected extensive zones of intermittent hydrothermal alteration consisting of clay and intense silicification beginning at 360 m and continuing until 560 m. The alteration zones were closely associated with graphitic fault and shear zones which often measured elevated radioactivity, but nothing exceeded 500 cps. Hole RK-17-118w1 was drilled as a 100 m up-dip step-out to the mother hole. It intersected similar lithologies and alteration. Additionally, RK-17-118w1 intersected anomalous radioactivity marked by visible disseminated pitchblende mineralization measuring a maximum of 1,300 cps over 0.5 m beginning at 490.5 m downhole. Holes RK-17-118 and RK-17-118w1 were terminated at 1074.5 and 855.5 m, respectively. Hole RK-17-119 was drilled to test for the presence of mineralization to the northwest of the Arrow deposit. The hole targeted a 3D resistivity anomaly located 100 m northwest of the Arrow Deposit resource domains and was drilled at an angled orientation (-68° dip) to the southeast (147° azimuth). RK-17-119 intersected basement lithologies consisting of silicified intrusive gneiss followed by locally clay and chlorite altered Arrow-like semi-pelitic gneiss before being terminated underneath mineralization in the A1 shear at 993.5 m. No anomalous radioactivity was intersected. Natural gamma radiation in drill core reported in this news release was measured in counts per second (cps) using a Radiation Solutions Inc. RS-120 gamma-ray scintillometer. The reader is cautioned that total count gamma readings may not be directly or uniformly related to uranium grades of the rock sample measured; they should be used only as a preliminary indication of the presence of radioactive minerals. All intersections are downhole, true thicknesses are yet to be determined. Resource modelling in conjunction with an updated mineral resource estimate is required before true thicknesses can be estimated. 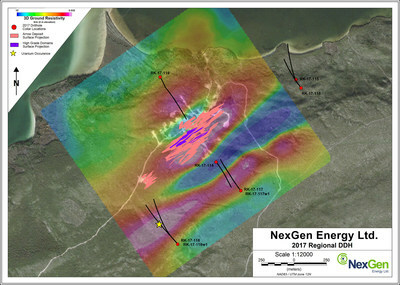 All scientific and technical information in this news release has been prepared by or reviewed and approved by Mr. Garrett Ainsworth, P.Geo., Vice President – Exploration & Development for NexGen. Mr. Ainsworth is a qualified person for the purposes of National Instrument 43-101 Standards of Disclosure for Mineral Projects ("NI 43-101"), and has verified the sampling, analytical, and test data underlying the information or opinions contained herein by reviewing original data certificates and monitoring all of the data collection protocols. For details of the Rook I Project including the quality assurance program and quality control measures applied and key assumptions, parameters and methods used to estimate the mineral resource set forth below please refer to the technical report entitled "Technical Report on the Rook 1 Property, Saskatchewan, Canada" dated effective March 31, 2017 (the "Rook 1 Technical Report") prepared by Mark B. Mathisen and David Ross, each of whom is a "qualified person" under NI 43-101. The Rook I Technical Report is available for review under the Company's profile on SEDAR at www.sedar.com. This news release contains "forward-looking information" within the meaning of applicable Canadian securities legislation. "Forward-looking information" includes, but is not limited to, statements with respect to the activities, events or developments that the Company expects or anticipates will or may occur in the future, including, without limitation, planned exploration activities and the completion of an updated mineral resource estimate. Generally, but not always, forward-looking information and statements can be identified by the use of words such as "plans", "expects", "is expected", "budget", "scheduled", "estimates", "forecasts", "intends", "anticipates", or "believes" or the negative connotation thereof or variations of such words and phrases or state that certain actions, events or results "may", "could", "would", "might" or "will be taken", "occur" or "be achieved" or the negative connation thereof. Such forward-looking information and statements are based on numerous assumptions, including among others, that the results of planned exploration activities are as anticipated, the price of uranium, the anticipated cost of planned exploration activities, that general business and economic conditions will not change in a material adverse manner, that financing will be available if and when needed and on reasonable terms, and that third party contractors, equipment and supplies and governmental and other approvals required to conduct the Company's planned exploration activities will be available on reasonable terms and in a timely manner. Although the assumptions made by the Company in providing forward-looking information or making forward-looking statements are considered reasonable by management at the time, there can be no assurance that such assumptions will prove to be accurate. Forward-looking information and statements also involve known and unknown risks and uncertainties and other factors, which may cause actual events or results in future periods to differ materially from any projections of future events or results expressed or implied by such forward-looking information or statements, including, among others: negative operating cash flow and dependence on third party financing, uncertainty of additional financing, no known mineral reserves, assay results may not be consistent with preliminary results, alternative sources of energy, aboriginal title and consultation issues, reliance on key management and other personnel, potential downturns in economic conditions, actual results of exploration activities being different than anticipated, changes in exploration programs based upon results, availability of third party contractors, availability of equipment and supplies, failure of equipment to operate as anticipated; accidents, effects of weather and other natural phenomena and other risks associated with the mineral exploration industry, environmental risks, changes in laws and regulations, community relations and delays in obtaining governmental or other approvals.